Life becomes so hectic nowadays. It is hard balancing between family and work . Comprising in a part is not a option. This is an easy and handy recipe for working women like me. My mum is used to make for me. She uses coconut paste. But I use coconut cream to make it handy. Hope that your family will love this simple recipe. 1. I peel the prawns to keep the head and tail. Devine the prawns and wash it. 2. Fry the onion on medium heat till it becomes soft and add chilli, turmeric and salt. 3. 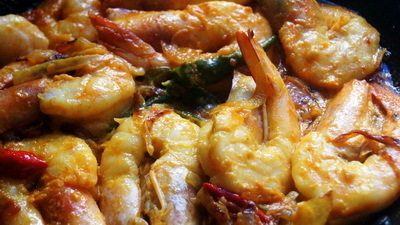 Stir it and after 1 minute add prawn and coconut cream. 4. 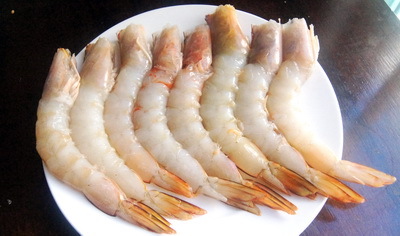 Cook it till prawn is tender. 5. 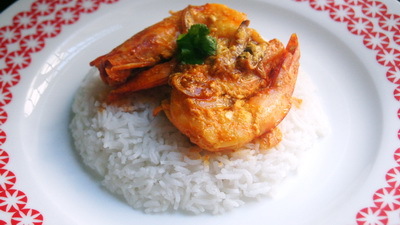 Serve fried prawn / chingri bhaji with hot rice. Thanks Rownak for posting such simple but wonderful recipes. God bless You.